This microscale scene by Nicolas Kolbeck is instantly recognizable to any Harry Potter fan as the eclectic wizard village found on the other side of a brick wall behind the Leaky Cauldron in London. 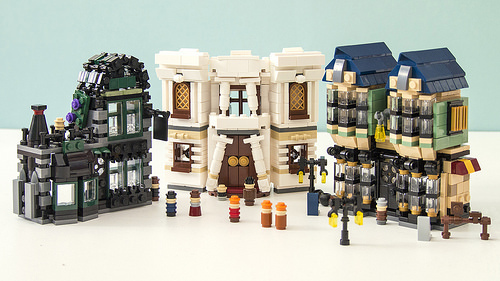 Even more impressive than the many details that stand out, like the angled windows of Olivander’s shop and the leaning pillars of Gringot’s Bank, is how recognizable the various miniature characters are. Notice the fez part used as a skirt for Hermione, and see if you can name the rest.